(CNN) -- Two teams of scientists say they have found a key area of the H5N1 bird flu virus which seems to be vital to its ability to copy itself, and hope the discovery could lead to new drugs to fight the infection. 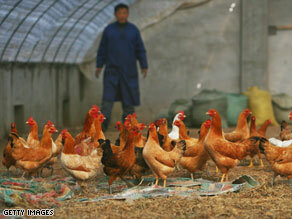 Human-to-human transmission of avian flu is rare, but in some cases, the virus has passed from poultry to humans. The discovery is generating excitement among scientists who are looking for a new weapon against the bird flu virus that typically kills more than half its human victims. Two separate groups of scientists -- one in China, one in France -- used a highly technical process to identify protein that seems to be involved in its ability to replicate itself. That gives researchers a new target, as they try and develop new medications. The announcements, detailed in the British-based journal Nature, come at an uneasy time for those who follow the bird flu strain called H5N1. So far this disease is mainly affecting birds in some countries and the number of human cases remains small, but the virus has shown no sign of growing milder since it first infected people back in 1997. It continues to decimate bird flocks in sporadic outbreaks, mostly in Asia, and occasionally breaks into the human population. China's Ministry of Health reported eight human cases last month, including four deaths. Since 2003, the World Health Organization has confirmed 404 human cases worldwide. Nearly two-thirds of the victims have died. While H5N1 doesn't make headlines the way it did in 2005, health officials say the continuing severity of the infections means the alarm is still on. Influenza viruses, in general, spread easily. If H5N1 were to acquire the genetic ability to pass easily from person to person, it could turn into a major catastrophe. Many countries have stockpiled both vaccines and antiviral medications, for such a scenario. The same medications that are used to treat regular flu, oseltamivir (Tamiful) and zanamivir (Relenza), also seem to be effective against H5N1. But that's no reason to rest easy. All flu viruses tend to mutate rapidly, which is why the flu vaccine one year, won't protect you against the next year's flu. Those rapid mutations mean the virus tends to develop a resistance to any widely used medication. Dr. Anthony Fauci, Director of the U.S. National Institute of Allergy and Infectious Disease, told CNN, "It always happens that eventually, sooner or later, the [flu] virus will develop varying degrees of resistance. You just hope that it's kept to a minimum." The findings in Nature may lead to another option to fight bird flu, but an actual new drug is years away. A vaccine could be effective, but they first have to know what strain of flu they're fighting. The current strategy of health officials around the world is to try to contain isolated cases before they spread. The best case scenario would be, that this H5N1 killer remains primarily a disease for the birds.